Our first render of today is of a British tank that holds a special place in the Forgotten Hope community, having been suggested heavily by the community. It is the Churchill Mk. III infantry tank! The British Churchill was a heavy infantry tank that came into service in 1941. It was large, well armed, well protected, and would spawn many Churchill-based variants later in the war. In 1942, six Mk. IIIs were sent to help fight the Germans in North Africa. Armed with 6-pounder main guns, the tanks of "KingForce" were reportedly able to hold out and only sustained minor damage from anti-tank guns. The Mk. III would be later replaced by the more numerous Mk. IV variant, but not before the Mk. III would be credited with capturing the first Tiger tank for the western Allies. The Churchill Mk. 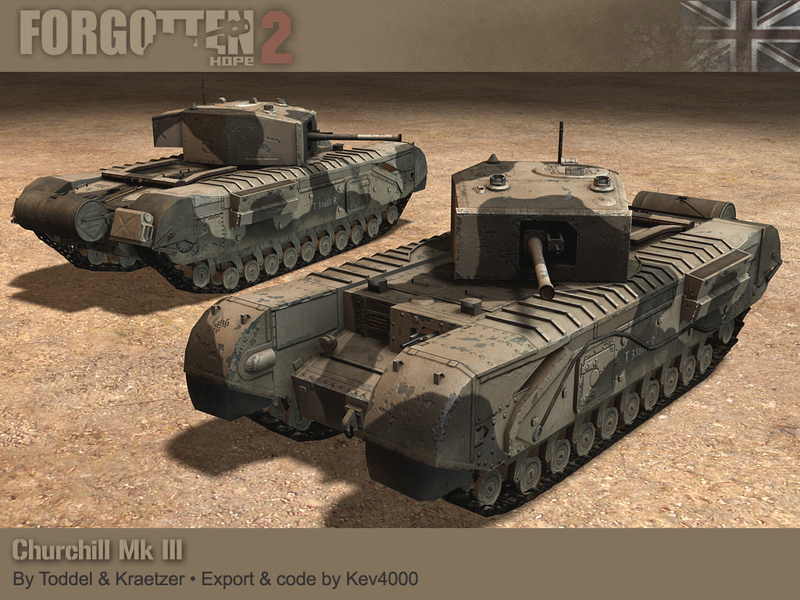 III tank was made by Toddel and Kraetzer. It was exported and coded by Kev4000. Forum name, in-game name, server you manage, and website of server. Thank you. Our winner for this week's screenshot competition is Droidi(Fin). You can view the winning submission here. We are now accepting entries for the week of Jan. 15th. If you think you have the best FH2 screenshot, post them here.